After over a year of knitting (Well, mostly hibernating), I'm pleased to share my finished Citron shawl. I've always loved the simplicity of the pattern, and had a tendency to get jealous of all the other bloggers that I would stumble across who had the patience to finish one of these. 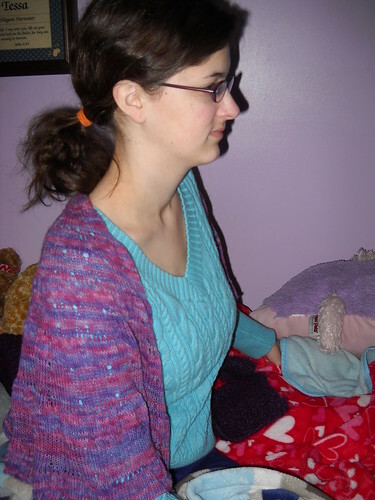 Late in 2011 when I found out about a great sale on bare lace weight yarn (Sanguine Gryphon, which I think has now split into 2 different companies), I knew I had the yarn for this pattern. I dyed it myself with McCormick food coloring and vinegar (blogged about here) and cast on early in 2012. After getting about 3 sections in, the rows started to be too long for my lack of patience, and my berry Citron went into hibernation. 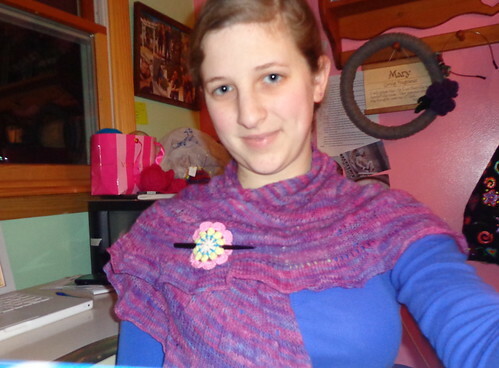 I was compelled to bring it back out after the 10 minutes a day "challenge" on the Cold Sheep board on Ravelry. The idea is that if you spend at least 10 minutes a day on one of "those" projects that drive you insane, or whatever, then eventually it will get properly finished. My original plan had been to use up the entire 800 yard skein of yarn. However, with my patience still on edge, and after realizing that the original pattern was a fine size with only 5 sections and a ruffle, I just stopped. I did end up using about 510 yards of the yarn... so now I need to find something else to make with it. I think a over-dye may be in order. Linking with Tami's FO Friday, after a few weeks of quiet. 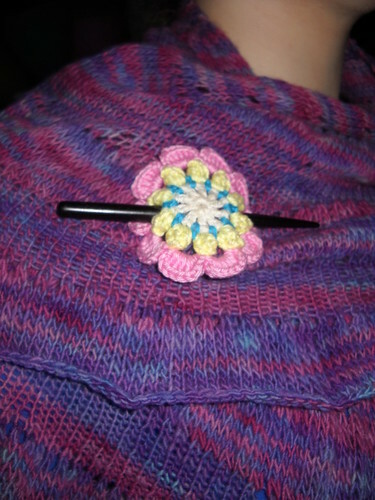 Lovely shawl and a cute pin! It's just a new idea for me. Happy weekend! 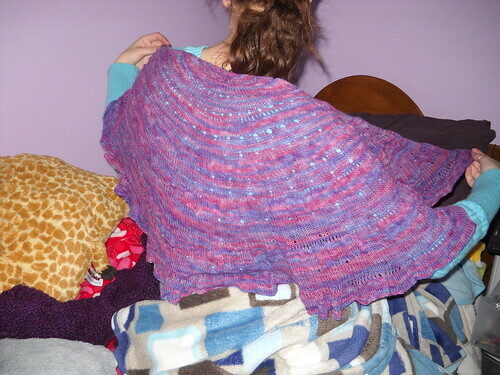 The shawl is beautiful. I think I'm the only one that hasn't done the Citron yet. Very cute pin ! It's lovely, well worth the wait, and the the colours are great. It is lovely. I love my Citron, but dream of making another in a larger size. Maybe that would be a great way to do it, a timed session of working on it. Must ponder this. That is a lovely Citron ... the colors are great, very jewel-like. Congrats on finishing, and thanks for the ten-minute-a-day tip, I shall use that to work on the Morningstar shawl which is driving me nuts!! What a pretty dye job! The yarn is great, too, The Verdant Gryphon still sells Mithril. The pin is a gorgeous detail. I love the pin, such a good idea. This is gorgeous. 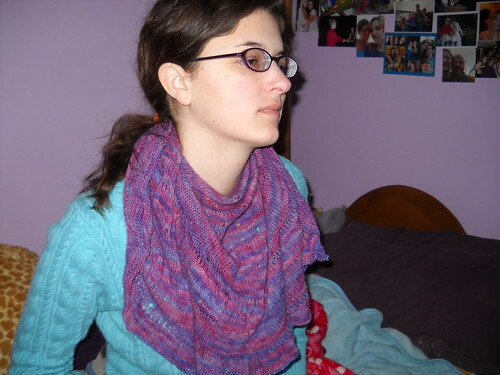 I love the colors and am so impressed that you dyed the yarn yourself. And, good for you to finish something from deep hibernation! I love the idea of 10 min a day.